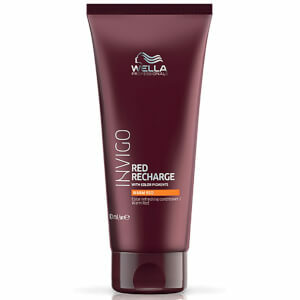 Recharge the vibrancy of your locks with the Wella Professionals INVIGO Colour Recharge Red Conditioner. Infused with the brand’s proprietary Colour Recharge-Blend™ colour-depositing pigments, the nourishing formula refreshes and maintains the multi-dimensional colour tones, leaving hair soft and intensely conditioned. Påfør på rent, fuktig hår og fordel jevnt. Skyll grundig.